Becky Lynch and Ronda Rousey have been the faces of the Women's Division in WWE this year, both having been champions on their respective brands. Although Becky Lynch has since lost her championship to Asuka, she is still the fan-favorite of the company at the moment. Lynch will be facing Asuka at the Royal Rumble for the SmackDown Women's Championship, but will also be participating in the Women's Royal Rumble match. If she is to win, she has the option to challenge Rousey for her championship on the "Grandest Stage Of Them All." The match has been highly anticipated for a long time, and the potential feud between the two tough women can easily hold the main event slot for Wrestlemania. 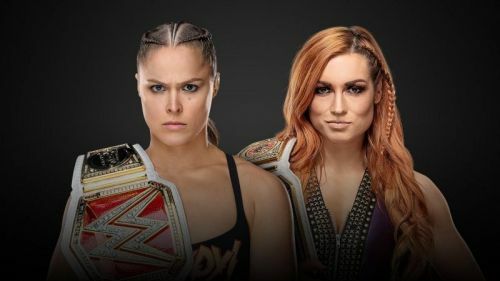 Here are three reasons why Becky Lynch vs. Ronda Rousey needs to be the main event of Wrestlemania 35. Becky Lynch was supposed to take on Ronda Rousey at Survivor Series this year; however, she sustained a face injury from Nia Jax in a botched move while invading Monday Night RAW, leaving her unable to compete. Because of this, she was subsequently replaced by Charlotte Flair, postponing her match with Rousey to a later date. Lynch vs. Rousey has been a dream match for WWE fans since they began pushing the feud, so it only makes sense for the two to have their long-awaited bout at Wrestlemania. Ever since Lynch turned heel this year, she has drawn a lot of supportive heat towards her. Since she and Rousey are polar opposites on a heel/face spectrum, the potential match they could put on would be phenomenal. The heat that could build between the two huge personalities from now until April is exciting enough to main event the largest pay-per-view of the year.